Its funny I knew exactly what it was physically, and was prepared to have some fun with it. But I must say my first 15-20min experience with the default app google put out first, It blew away all my expectations. Sure the cardboard rig was clumsy, the magnet switch was finicky, the pupulary distance was not quite right, and my big head and mismatched perscription eyes were less than ideal for it. but it was just a toe in the water. I could always modify(cut, tape, shape) the cardboard, or even lasercut my own wide enough to fit my face, (which I later did). but even withh all its warts, it was a very fun, “You gotta try this” thing. I love watching people when they realize they can actually look around, or fly around, or see the world with interesting camera effects. view masters disks, full of Disneyland I remember so well (much better than actually visiting at age 5). But with the update of Accelerometer/gyroscope, and real time image rendering. (these contraptions we call smartphones are amazing bits of tech we take for granted every day). 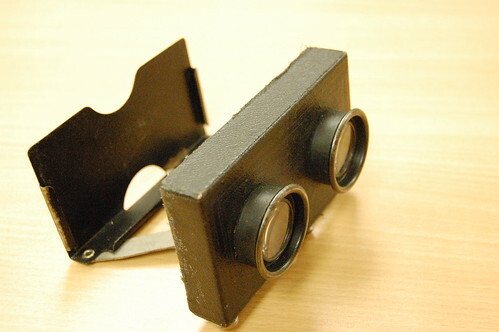 So from day 2, i decided i needed to retrofit Google Cardboard, into a classic stereo viewer. 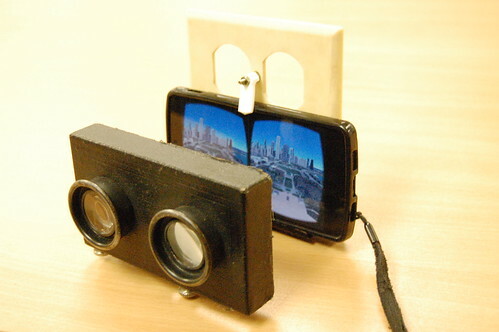 So i tracked down a small pocket travel stereo photo viewer and out of junk cobbled together a phone holder for it. One of the many things I’ve always dreamed of Quelab being, is a place various clubs and organizations which are inline with the interests of Quelab and the member interests could meet at. Aside from the now semi defunct 2600 meeting’s this has not been realized as well as I hoped. 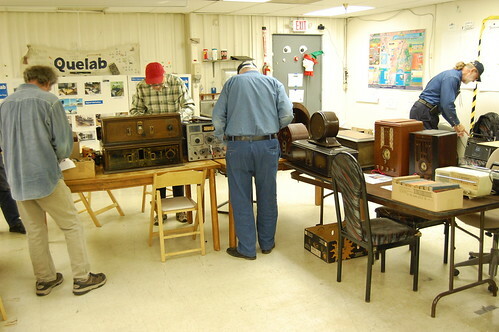 But the idea was kicked off in grand fashion by the visit of the New Mexico Radio Collectors Club (NMRCC) A dedicated group of collectors and restorers and repairs of everything from vintage console radios, to the tabletop tombstone ones, all the way down to pocket transistor, and some members are into the HAM aspects too. 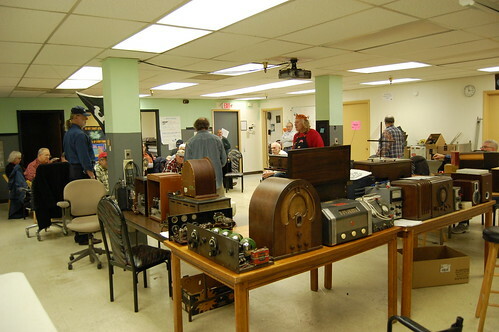 The club held its annual potluck, swapmeet, meeting, Show and tell, and club auction, there were some beautiful radios. They also had an AM transmitter connected to a XM radio playing classic 1920’s-1940’s tunes, for one of the restored console radios. I snapped some photos of the meeting There was actually a lot more cool stuff I never got around to snapping. More can be seen here on our flickr feed. On this date in 2010 We signed the lease on the first location that Quelab opened. We knew at the time it was not perfect, but with less than 7 people onboard we knew this was a community we needed to grow before we could even dream of perfect. Quelab 1.0 was a quaint little place, a pretty old converted house (previous to us it was used as a flower shop), less than about 1200 sq foot of usable space (billed as 1400), it was quirky, But it let us have a space to “build it and see if the come”. It was not the dozens of people we hoped for but a small trickle. Our first tasks were building workbenches and some shelving, moving in some tables (most scrounged), chairs. By our grand opening party on August 12th (note that date Its when Quelab is going to observe its birthday this year with some Cake and Icecream with the members.) We had some bits of equipment, and we were just starting to make a name for ourselves. Can’t say the next 4 years were easy, most of the time we were broke and being propped up on donations, and there were many times where we could have just closed the doors rather than digging deeper, We grew at a slow pace, and there was little chance we could reach out far and fast enough to survive on memberships alone. And none of us were good at grant writing, or experienced marketeers. Swapmeet’s, Steampunk Crafting, Hacking_Chocolate and more. We started hosting the Albuquerque Mini Maker Faire, and the Ignite Talks meetings, We setup booths at Tedxabq, Ace, and various other spaces. We have been toured by Caleb Kraft of Hackaday, we have won several Contests (Inventables, Instructables). In November of 2013 after more than a year of hunting, Quelab was able to move to the grand Quelab 2.0 Campus we are in now. With over 340 people in attendance at our @nd grand opening (that is a huge increase over the 24 or so people who made it to our first one.) And a membership in excess of 50 members we are still on rocky waters but we have come a long-long way baby! Thank you Albuquerque Makers, and supporters everywhere! Here in the Southwest, we are entering Year 5 of the drought, and there are more firework restrictions than ever. So once again I have compiled a few ideas/links from my own head and around the net. Share and enjoy! Buy an extra long roll of bubblewrap (or collect it from places that get lots of things shipped), put it down on a sidewalk or driveway and have a little bubble walking parade! Milk jug rockets Got old snap top milk jugs? How about making little rockets for the tops, and pouring a little baking soda in the bottom, pour in a few table spoons of vinegar and snap the cap on, and stand back. (experiment option alka-seltzer tablets can work too, which works better? Youtube videos and a data-projector outside on your garage door! If you live anywhere really dark (or inside)and don’t have a data-projector, you can project a monitor using a cardboard box and a magnifying lens (those flat fresnel lenses they sell at bookstores work great! Check out this YouTube video, which while not super fireworky, it’s a fun bottled show. Spitballs, waterbeads, watergems; whatever you call those jelly spheres that they sell for putting in flower arrangements and as kids toys… Put them in a tall thin plastic bottle with a few glowsticks or cheap LED lights (Dollar Tree has flashing color LED bracelets), then toss it around in the dark. The spheres all work as little lenses and look at how it projects on a wall in the dark! No Bottle Rockets? 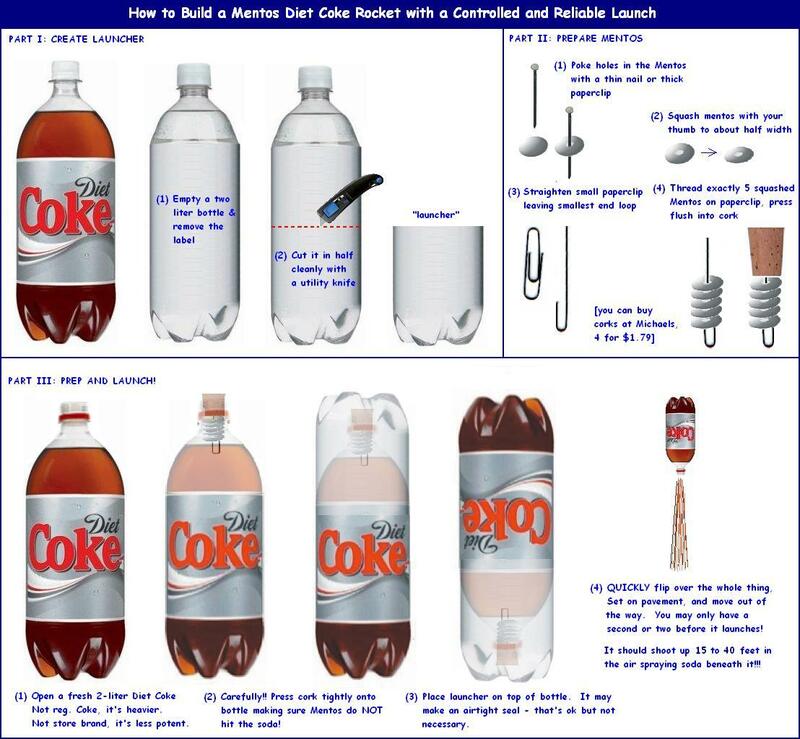 How about Paper Straw Rockets? Breath-powered and fire-free fun. LED, Tape, Magnet, and a disposable lithium battery turn into Throwies; these will glow for up to 3 weeks and can be tossed against anything magnetic (garage doors often work great). You can also collect them and tossed them over and over again! Check out this link to get the plans. Substitute Transparency material with the shiny side inside folded and taped into triangular tube (instead of their cardboard and foil), and use a Phillips screwdriver to poke a hole in the middle of the bottom for an eyehole). I’d suggest cling wrap over the open end and then fill with beads and confetti, and snap the lid on. Follow these instructions to get a world-class water balloon catapult. Get an air pocket in the corner of a ziploc bag, twist it off once and hold it in your hand. Sprinkle in some confetti in the upper part of the bag and zip it shut keeping as much air inside as possible. Hold above your head and quickly squeeze the air pocket — it should quickly untwist and then pop open the zip lock spraying confetti upwards! Needs cornstarch (or potatoes), Tonic water and a blacklight. Watch the YouTube video for the results. 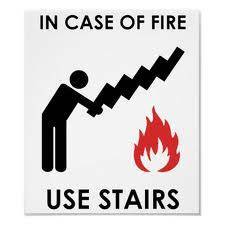 (no fire, but fumes and dangerous chemicals). Uses Sulfuric acid (concentrated battery acid) and Powdered sugar. This experiment should be performed outside or in a fume-hood. In a glass beaker or other heat-safe Pyrex container. Put a 1/4 cup sugar in the bottom, pour in a little sulfuric acid until the sugar is completely covered, stir quickly, then just sit back and watch the reaction. The sugar will change from white to dark brown, then to black carbon. Quick Thank You to everyone who helped make our Grand Opening event a huge success!! I hope myself or one of the rest of us is able to adequately express the gratitude and joy that seeing Quelab visited by such numbers of people, and seeing so many people get engaged and inspired and having fun! Thank you all! Quelab is proud to be part of this great community. Hope to see many of you back to do what spaces like this do best. Get people and tools Together to make dreams come true. 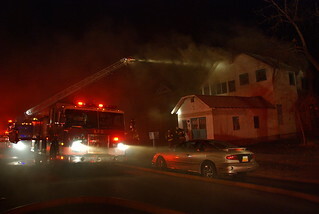 Here are some photos Taken by the Quelab Camera Yesterday. Meet The New Quelab Building! I have found the best description of how to get here is Exit I40 at the 6th street exit, go south 3 blocks to Haines, West one block and we are on the south side! Bright yellow and rust red building! Howdy all, Greg here. We’re trying to get a huge turnout for today’s monthly membership meeting (and Potluck). Please join us at 680 Haines NW (near 7th) to eat some food, meet all the new regulars, and get a sneak preview of the new Quelab version 2.0. NOTE: The new space will be pre-occupied for the next month as Blackout Theatre uses it for an interactive haunted house (post apocalyptic zombie survival event). I’ve already seen their set up and its FANTASTIC! While we’re there today, please be courteous of their set and look but don’t touch. Thanks in advance. New Mexico and much of the west is a huge tinderbox. The city, County and state have various firework bans going. So here is a few passtimes you can do without fire or atleast with a very minimal chance of bigger fire. -How about something that can be done in the kitchen, Food coloring falling explosions! Just need a tall jar, vegetable oil water and food coloring instructions can be found here. http://chemistry.about.com/od/4thofjulychemistry/a/waterfireworks.htm Some little LED flashlights can be fun for lighting up individual drops. -Glowsticks! They are awesome on their own, but for science abuse, not bright enough? try microwaving them for 5 seconds (careful if you do it too long they can melt or leak), if its no brighter after 5, give it another 5, but no more than 15 seconds total! -bubblewrap! who needs firecrackers if you can pop or jump on or runover with a bike bubblewrap! Please share this around! These are just a few of the many ways Quelab wants you to be creative and have fun! Quelab just compiled most of these links the credit goes directly to the people who made these for coming up with great posts on these subjects! Happy 4th of July for you all!